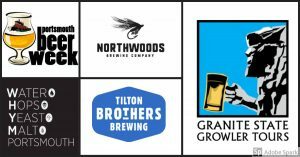 Granite State Growler Tours is proud to partner with WHYM Craft Beer Cafe for the 6th Annual Portsmouth Beer Week Hangover Cure Tour including a unique first peek at Northwoods Brewing Co and Tilton Brothers Brewing ! End Portsmouth Beer Week with great food and delicious beers! In past years, we have been the first people to see, tour and drink at Smuttynose, Deciduous, Liar’s Bench, Woodland Farms, Loaded Question, Great Rhythm, Empty Pint Brewing AND Corner Point Brewing Company. This year we will have 2 buses ready to roll but don’t wait too long, we sell out every year! We will have 28 total seats available, arrive at WHYM for a private brunch at 11 then we will depart for the breweries at 12:00pm.